Finally all the Bernina software is installed on a new laptop computer Rick bought just for my sewing machine. It was becoming too difficult trying to use our old PC and Rick did not want me tying up the mac more than I already do. He needs to use it for his artwork. I am still using the mac to post to this blog because it has photoshop on it. So now I know more than I wanted to know about Windows System 7, though I do not think it is enough. I am guessing about lots of things. The printer is working and I can scan. 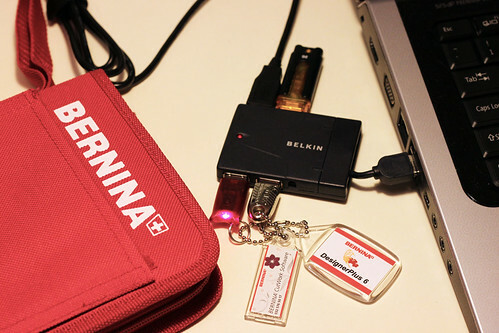 I can send embroidery designs to Belle or put them on a 2G thumb drive. I did that just to make sure both of sewing machine usb ports work. I only had to restore and reinstall everything once (in a particular order). Now I just need the time to go through the manual and teach myself the digitizing programs. There are so many things I want to make. First I have to finish the shirt I promised Rick. The photo shows the cute little mini usb hub attached to one usb port on the laptop. It is so tiny. Each software program requires a dongle for security. All the new computer technology keeps my head spinning. Belle can only read from a 2G or less usb stick. She doesn’t have the computing power to search a larger one. The usb cord attaches right to the machine. Now that everything is set up, all I am missing is a brain that can handle all the information. Just like Belle, I will need to take in the information in small batches. It will take longer, but what else can I do? This entry was posted on Wednesday, December 16th, 2009 at 3:00 am and is filed under Bernina 830 and Life. Tagged: Sewing. You can feed this entry. You can leave a response, or trackback from your own site. If anyone can figure it out, you can! You never miss a detail. Is the dealer offering mastery classes? Wow! you are definitely miles above my few computer skills…but what fun with all this new technology. Really looking forward to watching your projects develop. Know you will have a great time with this. WOW! That sounds like quite the sewing machine! I cannot wait to see what kind of amazing things you create once you master that fabulous machine! Thanks for stopping by to wish my Happy Holidays! Merry Christmas and Happy Year Twenty~Ten to you, too! Yikes…is it REALLY TWENTY TEN??? Well, not now, but in a few days…yes, it is! …sigh… I’m getting so old! Oh, bummer…you are getting the sewing machine all jazzed up and now there’s no more blog posts from you. Well, I hope you guys get another Mac or PC or something just for YOU! You are missed in blogland. On the other hand, I haven’t been visiting blogs like I used to so I don’t feel left out that I didn’t miss anything…but you’re still missed!